What a spectacular state park! Wilderness State Park's 2,582 acres of natural area and 4,492 acres of wilderness area make this a great place to explore all year 'round. Waugoshance Point is a part of Wilderness State Park along with Temperance Island and Waugoshance Island off the tip of the point. The area around this point is the habitat for the endangered piping plover. Approximately one-third of the nation's nesting areas for the piping plover are in Wilderness State Park. 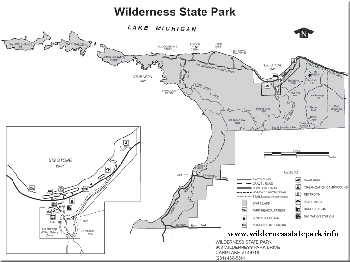 Much of the park cannot be accessed by roads--yes, this is indeed a wilderness state park. More than 22 miles of mapped trails are in the park along with 5.5 miles of the North Country Trail. The park's 26 miles of beaches are great for walking, swimming, and stone skipping. 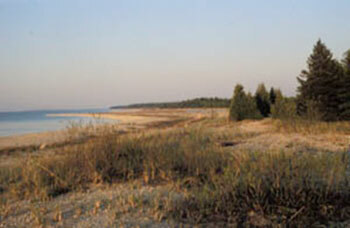 The beaches are mostly rocky but the beach area near the campground is sandy with a sandy bottom. Camping at Wilderness State Park's draws campers from around the country because of the setting--gorgeous! The two campgrounds total 250 spots. There are six rustic cabins and three bunkhouses located around the park that can be rented throughout the year. During the winter months, visitors can cross country ski or snowshoe into the cabins and bunkhouses. Wilderness State Park has a boat launch area, picnic areas with grills, fishing, and hiking, biking and cross country ski trails. The campground is open April-December; the park is open year 'round. Bring your kayak; the Lake Michigan shoreline area is a popular one for kayakers. During the warm weather months, a variety of education programs take place for children and adults. 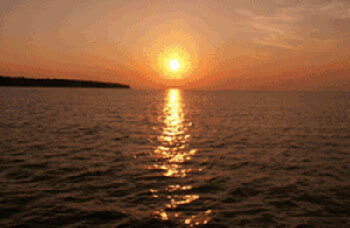 So put on the hiking shoes, pack the sun tan lotion and head to Wilderness State Park! Say it Mackinaw or Mackinac?